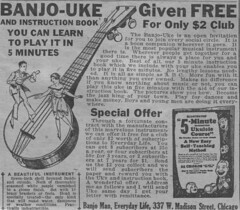 Back in 1926, you could get this banjo-uke for selling only $2 worth of subscriptions to Everyday Life magazine. Was it a come on? Let's check. Are all these claims true? Is the Banjo-Uke an open invitation to join every social circle? Is it a boon companion wherever it goes? Is it the most popular musical instrument there is? Wherever people get together for a good time, is there always a place for you and your uke? Will you have more fun with it than anything you've ever owned? Will you become the jazz king of your town? Will you be able to play for dances and make money? Are boys and young men doing it everywhere? And then, about all those subscriptions you have to sell. How much is that in 2010 dollars? Well the good new is that all the claims are absolutely true, as we all know. And $2 is only about $24 in today's dollars. Could you sell $24 worth of stuff today to get a banjo-uke and become the Jazz King of your town? Yes, you could! I absolutely LOVE this! You breathed new life into that brittle, crumbling ad. Thanks! And thank you for posting it! What do you know about this magazine? I couldn't find anything on the web about it. banjo uke, Gary? And when I'm Jazz King of this town, Nobody, but Nobody, will ever kick sand in my face again! Ukester Brown: okay, there was ONE lie in the ad. Ron Hale: I think you're thinking of the Charles Atlas Ukulele School. I don't know about that. Can a banjo-uke really compete with a barrel-of-monkeys? Doubt it. About the magazine "Everyday Life" - I found it in an Oklahoma local antique/junk shop that carries a lot of ephemera. I liked the faded cover, and felt the ads were a quite interesting glimpse into the past. It was a 20 page affair printed on cheap paper out of Chicago. It had several pulp stories, some of which were in installments, and many puzzles for prizes, "free" merchandize as long as you sold something, and ads for everything from hunting hounds to early viagra ("Glanol - have healthy glands as when young") to home remedies for the "childless woman". And there is another small ad promising a banjo-ukelele (must have been a popular instrument) for selling only 12 "Ordway Famous Plasters for Rheumatism and Pain" at 25 cents each. I had never heard of the "banjo-ukulele" before this magazine.